Beauty Professor: Ponds Luminous Collection...What Makes You Luminous? 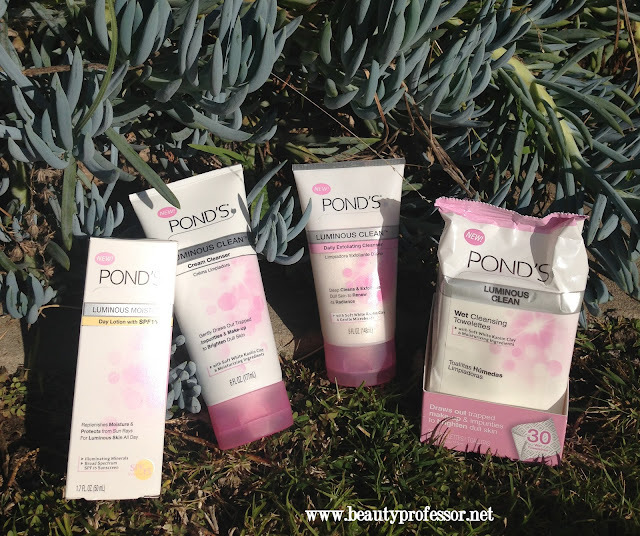 Ponds Luminous Collection...What Makes You Luminous? Above: The Ponds Luminous Line...Luminous Moisture Day Lotion, Luminous Clean Cream Cleanser, Luminous Clean Daily Exfoliating Cleanser and Luminous Clean Wet Cleansing Towelettes. Luminous skin can be achieved in many ways...a fantastic glowy foundation, an illuminating highlighter or a sheen-inducing beauty oil can deliver the luminosity that we all crave. 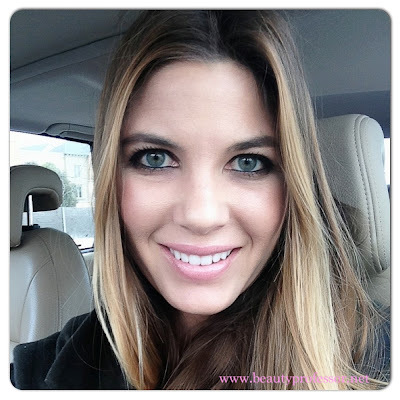 Often, however, luminosity starts at a basic level...with healthy, balanced skin. I recently had the chance to try some products from the Ponds Luminous line and was impressed by the way in which they helped to transform my dehydrated winter skin into a moisturized wonder! 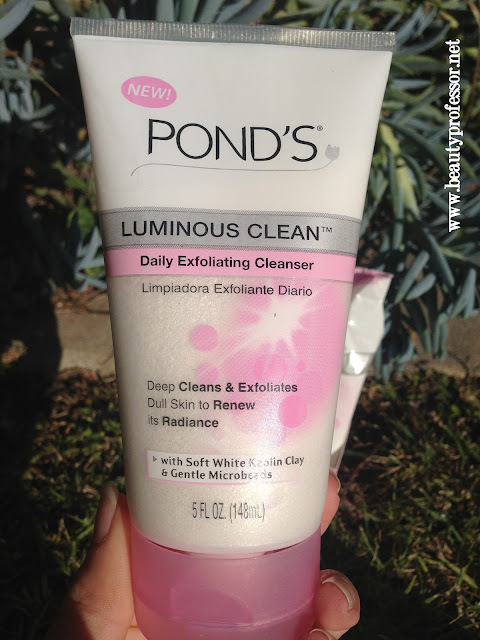 Above: Ponds Luminous Clean Exfoliating Cleanser is fast becoming a staple in my shower. I especially like the Luminous Clean Daily Exfoliating Cleanser...I have been using this on my arms and legs when I shower and love how smooth and balanced my skin feels afterwards. It preps my legs for shaving (I'm the type of girl who shaves everyday, no matter what!) and effortlessly exfoliates while somehow leaving me feeling moisturized (even before I apply my post-shower lotion). Above: The Luminous Day Lotion prior to being rubbed into the skin. 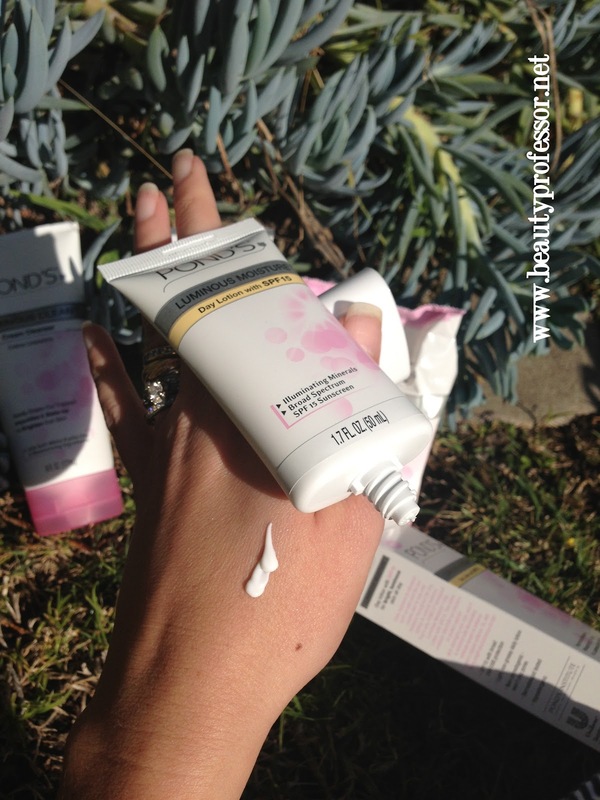 The Luminous Moisture Day Lotion is another standout in the line. In addition to the SPF 15, which is like "indoor" sunscreen for me ; ), it has an extremely subtle sheen that adds a glow without looking overly shimmery or leaving a white cast...the image below shows how completely absorbs into the skin, leaving a slight gleam behind (rather than a glitter bomb!). Since it is lightly fragranced, I plan on using this on my neck, decollate and shoulders (my ultra-sensitive face requires me to strive for unscented sunscreen as much as humanly possible) to create a healthy and protected glow. Above: After being rubbed into the skin...the sheen that the Luminous Day Lotion imparts is subtle! To celebrate the Luminous Line, Ponds is hosting a photo sweepstakes contest that inviting you to submit a photo depicting what makes you luminous. The contest is open now and the deadline for entry is 4/2/13...all the details can be found on the Ponds Facebook Page! Above: I feel my most luminous when my skin is healthy and clear and I have purpose in my day...in this image, I was just about to go teach public speaking. I love helping my students find and develop their authentic voice! 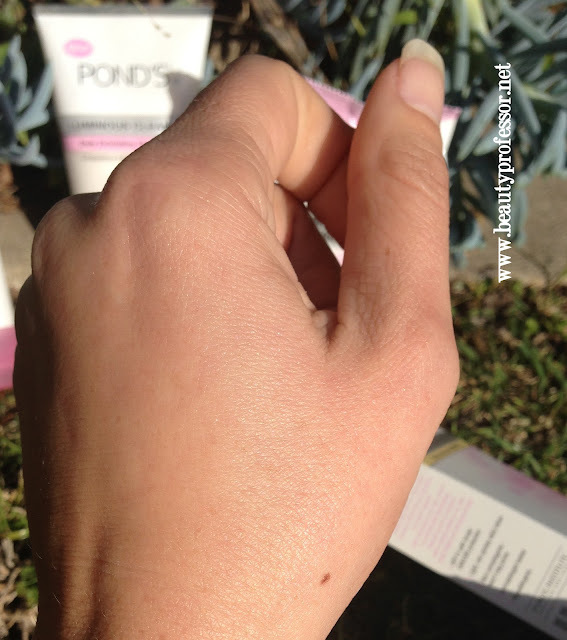 Ive never tried ponds before but heard great things about their cold cream which many use as a cleanser..